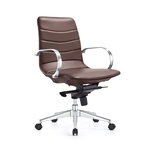 Office Furniture Deals provides best selling mid back office chairs for sale online in designer fabric, leather, and mesh back variations. With ergonomic mid back office chairs available from brands like Eurotech Seating, Global Total Office, and Woodstock Marketing, meeting your individual comfort needs is easier than ever. 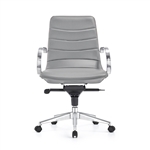 Our selection of mid back office seating includes top rated models for computing, tasking, executive office, and conference room applications. 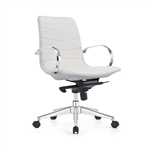 All of our affordable mid back office chairs include free shipping for even greater savings. Need help selecting a new mid back office chair with user friendly adjustment features? Contact our seating specialists today at 800-456-6746!